Prior to being released, I noticed advertisements and reviews for The Nest almost everywhere I went. There was so much buzz and hype around it. I read the synopsis and was really intrigued by the premise and just couldn't wait for the book to finally come. I read the book immediately after buying it. After three nights of reading, I put the book down and sad to say, it just wasn't my cup of tea. I'm giving the book three stars because I did enjoy the writing. It was an easy read that clearly expressed the writers vision. Where it all went downhill for me were the characters. Each one of the Plumb siblings and their mother were self absorbed and nauseatingly shallow. I could not find a way to emotionally relate to any of them. Each time I tried they would do something that just made my skin crawl. Most of my feelings towards these characters are likely the way they are because I come from a large, tight knit family. I can't even imagine what it would be like to have one of the Plumbs be a part of it. Though my dislike for these characters is clear, the one lesson learned that I will take with me from this book is to not promise a lump sum of money to my children while I am still alive...this of course is assuming I'll have a lump sum to leave them. In the Plumb's case, knowing that their father's money would be there "one day" lead to each one of their downfalls. The Nest appears to still have some hype circulating around it. If you're a foodie, a recent Toronto Star article lists a few restaurant recommendations, inspired by the book, located around the city. 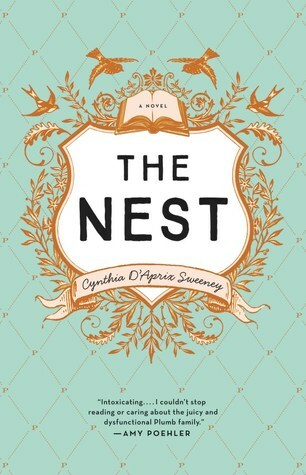 My final thought: If readers can get over the mental hump of disliking the characters, then, The Nest will provide them with an entertaining read about one of the most dysfunctional families out there. It took me over four months to finish this review and now, I'm really curious to hear about what other readers thought. Feel free to leave a comment and let me know!